Our cover crop, daikon radishes, grew in abundance and we didn’t know what to do with them all. Some of our friends suggested we try making Kimchi. Here’s something that could actually make your life spicier, healthier and more self-sustaining. In our ongoing gardening and homesteading project, we found that our cover crop, Daikon Radishes , grew in abundance and we didn’t know what to do with them all. Some of our friends suggested we try making Kimchi – Korea’s national dish. But we had never tried it… and were skeptical. We had already started fermenting vegetables to benefit from the long shelf life, homemade probiotics and more bioavailable vitamins and minerals. However, Kimchi was a whole new ballpark. Fortunately, it was successful and very tasty as well. Good for digestion and general good health! The vegetables used in your recipe naturally contain lactobacillus, but are multiplied during submersion in the saltwater brine, and that is a big part of what makes these foods so healthy and desirable. Moreover, your gut literally serves as your second brain, and even produces more of the neurotransmitter serotonin—known to have a beneficial influence on your mood—than your brain does, so maintaining a healthy gut will benefit your mind as well as your body. But, if you are making Kimchi and other fermented foods for their probiotic value, please note that you can add starter cultures to the batch to greatly increase the number of strains and count in your fermented foods. The two most highly recommended brands, recommended in countless blogs on fermented foods, are sold in packets by Body Ecology and Caldwell’s Vegetable Starter Culture . 10. After 4-7 days, it is probably ready. 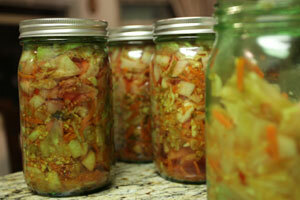 Taste and enjoy, or leave fermenting for a longer period to adjust flavor. 12. Experiment with other veggie and spice combinations… it adds lactobacilli probiotics, to help win the war in your intestine for good health.